Last week's pie was disappointing (more than half of it is still sitting in our fridge), so I decided to skip that particular stand this week and treated myself to flowers instead. The man who runs the stand is fun to talk to. I told him that my last bouquet from him lasted me two weeks and he asked if I kept giving them fresh water. I replied, Of course! to which he responded, "Yeah, they love that stuff." He's always extremely pleasant and positive, and I'm happy to buy my flowers from him. Apparently this week's bouquet has some sort of wild mint in it! 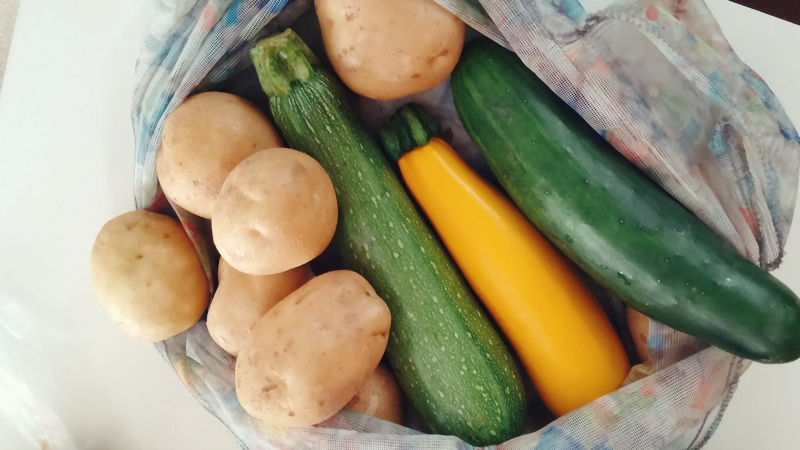 This week I got: a cucumber, yellow squash, zucchini, potatoes (we love 'em around here! ), lots of blueberries (twice as much as usual... 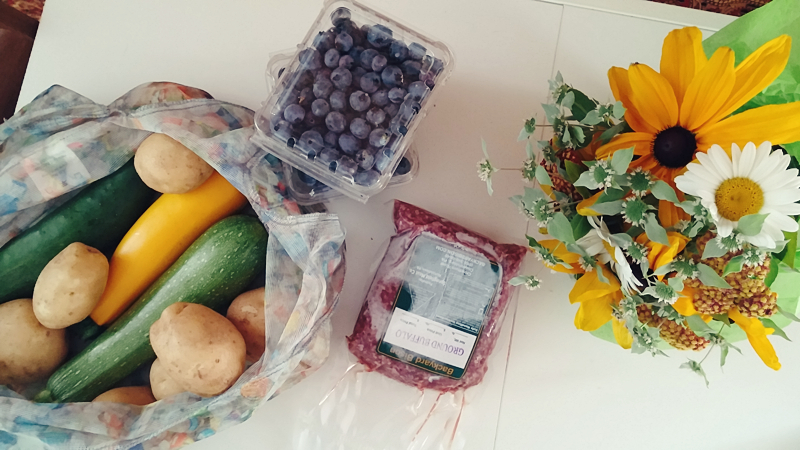 I'm thinking of baking a little somethin' somethin'....), frozen bison meat, and a lovely bouquet of flowers. I got a new phone last weekend and I'm still playing around with the camera (among other things, and probably will be for a while). I initially had trouble uploading my photos from it onto my mac, but I figured it out, and also found out that I'm using the super landscape mode, so my photos are a little shorter than usual... but they're so vibrant! I'm super happy with them so far, and I've adjusted the height/width ratio for all subsequent photos, though I really don't mind the super landscape feel that these have. those flowers are great! I love getting flowers from little local stands, i think they last so much longer and have more character than supermarket ones. I usually get my flowers from Trader Joe's because they often have well put-together bouquets that last a while, but lately they've been looking lackluster. 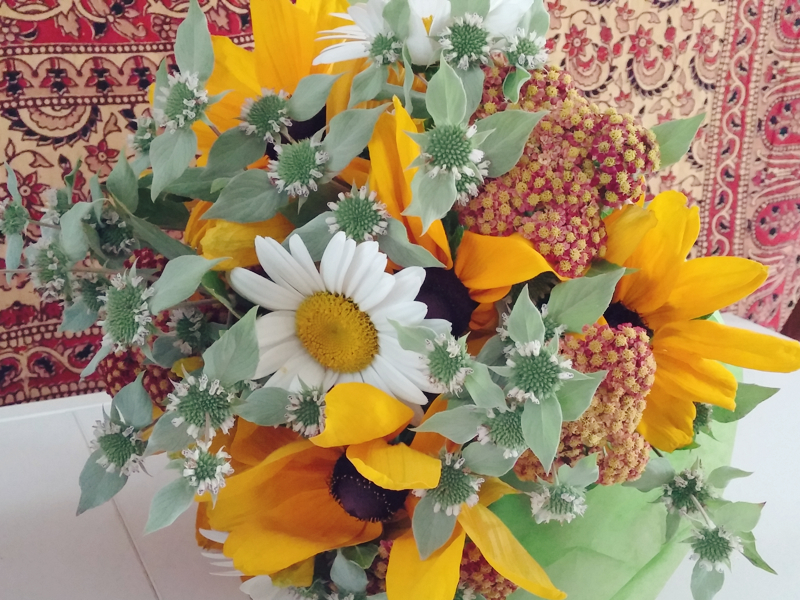 I also like the thought of getting to know the person who picked the flowers and put the bouquets together - every week he has completely different combinations!